In this Tense work is being done in the past on continuous basis. 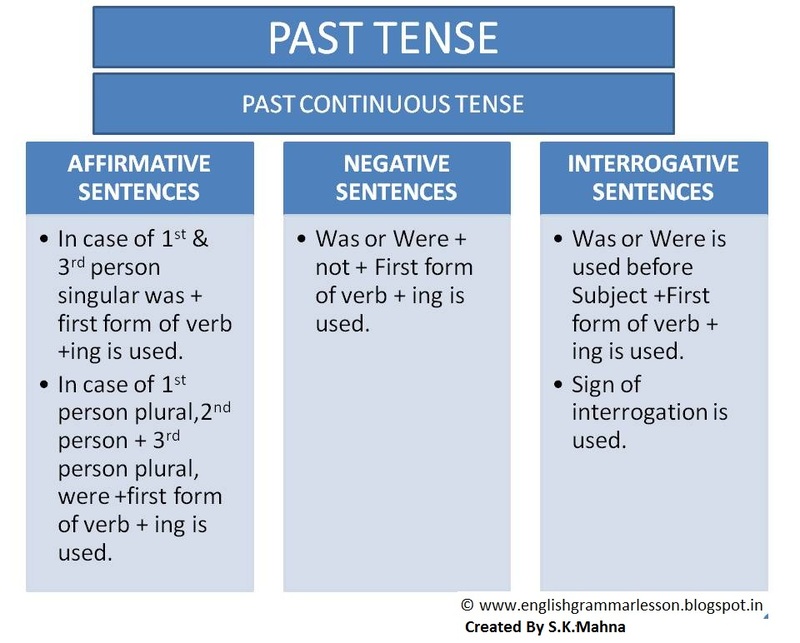 For this tense was were and first form of verb with ‘ing’ is used. With first person singular and third person singular was with first form of verb and ing is used. With first person plural, second person singular and plural and third person plural ‘were’ with first form of verb and ing is used. Girls were singing a song. You were going to the market. She was painting a picture. We were taking our meals. In negative sentences ‘not’ is used after was were and before verb. Boys were not making a noise. You were not taking your examination. The gardener was not watering the plants. We were not playing football. In interrogative sentences ‘was,were’ is used before subject. and first form of verb with ‘ing’ is used. Interrogative sign is used at the end of the sentence. Were you painting a picture? Was I walking in the garden? Was she cooking food in the kitchen? Were the boys playing a match ? Excellent post. I was checking constantly this blog and I’m impressed! Extremely helpful information specially the last part 🙂 I care for such info much. I was seeking this particular information for a long time. Thank you and good luck. Hello.This article was really interesting, especially since I was looking for thoughts on this subject last Monday. Great write-up, I am normal visitor of oneˇs web site, maintain up the nice operate, and It’s going to be a regular visitor for a long time. I do accept as true with all the ideas you have presented to your post. They are really convincing and will certainly work. Nonetheless, the posts are very quick for newbies. May just you please prolong them a little from subsequent time? Thank you for the post. I’d like you to specify your requirement about the topic. A lot of of the things you mention is astonishingly legitimate and it makes me ponder why I had not looked at this with this light before. This particular article truly did turn the light on for me as far as this particular subject matter goes. But there is actually 1 factor I am not necessarily too comfortable with so while I make an effort to reconcile that with the actual core theme of your point, allow me observe just what all the rest of your subscribers have to say.Well done. I’d like to know your requirement about the topic so as to make it more useful. It will be better if the required information is defined in specific terms so that the same may be provided/posed on the site. Thanks for liking and appreciating. I request for writing about your requirement to make it still better. Hey, you used to write fantastic, but the last few posts have been kinda boring?K I miss your great writings. Past few posts are just a little out of track! come on! You are requested to specify the required material relating to the topic I shall certainly provide the same on the site. Please come on in specific terms about the required information about the topic. I’d like you to specify the shortcomings so that the same are removed to make it more useful according to readers’ need. Thanks for your valuable remarks I approach you to suggest some other topics required by you to be discussed on the site.This will be very helpful for me. Let us also make it an interactive platform. Come along with some questions in the Discussion forum and the same will be replied and discussed as per need. Define your requirement relating to the topic clearly I shall certainly put in the required material accordingly. Yes soon but it ‘d be better if you suggest any topic required by you. Why don’t you put some questions or problems in the DISCUSSION forum? And the same will be replied. This will make it ore interactive.Nevertheless thanks for positive remarks.Do read and recommend to others to read. Kindly write your comments in English to make them understandble. I藝ve learn several excellent stuff here. Definitely value bookmarking for revisiting. I wonder how much effort you place to create such a fantastic informative site. Thanks for positive remarks. However I solicit your suggestions/views about subject matter so as to provide better information. Thanks for your positive comments Seek your valuable suggestions for improvement in material on the site to serve you better.